Pontos Requerido: 11750 Os jogos não são compatíveis com dispositivos móveis e tablets. Por favor adicione este título à sua Lista de Desejos e inicie a sessão na sua conta the first club desde um computador para concluir o processo de solicitação. NOTICE: Activation key must be used on a valid Steam account, requires internet connection. 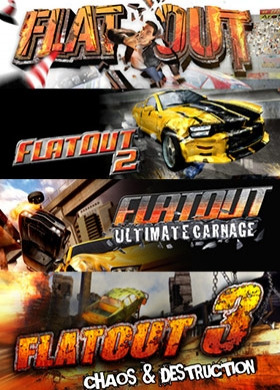 FLATOUT	Take Destruction to the next level of carnage in this action racing game.The track environment is subject to an advanced physics system unique to this game, and is set to define a new standard in racing games. Fences will shatter, tyre walls will explode, water tanks and barrels will fly across … the track into other cars.Every time you lose control, you will truly feel the weight of the car as it collides with and destroys a barn, or smashes into the pack of cars ahead of you, and with 40 deformable pieces on every car sparks are guaranteed to fly.An extensive championship mode will keep you 'flat out' for months on end as you battle through a huge variety of races, mini-games and the most outrageous arenas of destruction you could possibly imagine. KEY FEATURES 16 different cars to race, customise and upgrade Full car damage modelling which affects the performance of the car Unparalleled realistic scenery and debris damage with fully destructible driving environments Carefully tuned car physics to give a truly realistic feel to each car 45 tracks to master over 5 different environments including the challenge of snow-covered terrain. Two-player split screen mode for a AAA racing experience with friends A whole host of extra fun enhancing mini-games including 'Figure of 8' and 'Demolition Bowl' Online and multiplayer optionsThe following graphics cards when tested caused issues with the software. Game does not run with a Turtle Beach Santa Cruz sound card ('Crystal4630' chipset). Game does not run with a 'I/O Magic MagicQuad V8' sound card ('VLSIThunderbird 128' chipset). Game does not run with a 'Turtle Beach Montego II' sound card ('AurealVortex 2' chipset).Game does not run with a 'Jaton 3DForce S-128 Quad' graphics card ('SiS 315'chipset). Missing textures with a 'Apollo Blade Monster' graphics card ('SiS Xabre 400'chipset). Missing textures and corrupt menu with a 'ATI Xpert 2000 Pro' graphics card ('ATI Rage 128' chipset). Intro movie skips slightly on some systems : no known fix. Intro movie does not take up the whole screen on a 'GeForce 6800 GT'graphics card : no known fix. With a 'STB Voodoo 5 5500' graphics card ('3Dfx Voodoo 5' chipset) in gameplay a certain distance down the road is visibly darker. Its like this the entire race, the effect always so far from the player. Also the power lines are white.FLATOUT 2	In these high-speed races, the more damage you inflict, the better.The ultimate in turbo-charged cars and the craziest competitor drivers are waiting to test your best destructive streak.Responsible drivers need not apply. KEY FEATURES Thousands and thousands of objects to annihilate. Mini games gone wild - hurl the driver in these 12 crazy challenges. Wreck your way across parched deserts, massive storm drains and narrow city streets. Ram your opponents' car and watch them fly through the air - you're here to win!FLATOUT 3: CHAOS AND DESTRUCTION	FlatOut 3: Chaos & Destruction brings a new dimension to high speed destruction racing. Feel the adrenaline pulse through your veins as you barrel through insane race tracks against monster trucks, race cars, off road vehicles and much more. FlatOut 3: Chaos & Destruction is demolition racing at its extreme. Real world physics with 9 different game modes, and over 60 different vehicles available. Players may choose to race, smash and destroy their opponents in a wide variety of online and offline options. Lay waste to farm houses, fences, and then wreak havoc in a Detroit suburb, race up the walls in giant waste disposal sewers. Let the chaos begin as you race through over 60 different tracks, narrowly avoiding wrecking balls, Double Decker buses and much more. Create as much destruction in the all new monster tuck mode. Choose from 20 different playable characters, select your weapon from the 47 available vehicles! Create as much Chaos & Destruction! In stuntman mode anarchy rules! Create havoc with some rag doll fun. FlatOut 3: Chaos & Destruction offers more vehicles, game modes and different ways to demolish your opponents before crossing the finish line. KEY FEATURES Physics Engine capable of delivering over 20,000 fully destructible objects on every track 47 vehicles with everything from muscle cars, monster trucks, tanks, bulldozers and more 9 game modes plus challenge mode that incorporates all game modes into one 62 track race 10 racing environments with 62 different race tracks 3 stunt mode environments with 12 stunt tracks 9 Destruction Derby Battle environments All new Monster Truck, Nightshift, Off Road, and Speed modes 8 multiplayer modes with support for up to 16 players Force Feedback support for racing wheels Larger Destruction Derbies with 24 players Complete Chaos in Off-Road Mode Complete Destruction in All new Monster Truck Mode Head to Head in nightmarish, thunderous, rainy, fog weather in Night Shift ModeFLATOUT: ULTIMATE CARNAGE	Hi Octane motorised anarchy - Maximum fun, maximum chaos, and all in eyeball searing high definition, FlatOut - Ultimate Carnage is PC's most extreme destruction racer!With three distinct carnage-filled game styles, an integrated championship racing career mode and intense in-your-face destructive action, FlatOut Ultimate Carnage is the gaming world's most smash-tastic driving game to date! KEY FEATURES Huge number of race styles to suit every mood. Career racing: Compete in progressively. tougher championships, wrecking your way. through 3 classes to become the ultimate. FlatOut champion. Arcade racing: Deathmatch Destruction. Derbies, Carnage Races, Beat the Bomb and crash filled challenges. Crazy Ragdoll characters catapulted in-race and in 12 suicidal mini games. Single player with 12 drivers in a choice of 48 cars on 39 tracks. 6 different environments. 8000 objects to destroy per track. Up to 8 player simultaneous Live play including Races, Derbies and Stunts, plus the all-new Deathmatch Derbies and the excusive Head-On race mode. Fully supports Games For Windows Live. Deathmatch Demolition Derby online racing.SYSTEM REQUIREMENTS Minimum: Operating system: Windows® XP Processor: Intel® 2 GHz dual core CPU Memory: 2 GB Video: Nvidia GeForce 8600+ / AMD Radeon HD X2600+ Internet: Broadband Internet Connection DirectX®: DirectX® 9.0c Hard disk space: 16 GB Sound: DirectX® compatible Onboard Soundcard Supported Input Devices: Keyboard, Joystick, XBox Controller, Gamepad, Microsoft Controller for Windows Additional Notes: Also supports Razer Hydra.Recommended: Operating system: Windows® 7 Processor: Intel® Quadcore Memory: 4 GB Video: Nvidia GeForce GTX 590 / AMD Radeon HD 6970 Internet:Broadband Internet Connection DirectX®: DirectX® 9.0c Hard disk space: 20 GB Sound: DirectX® compatible Soundcard Supported Input Devices: Keyboard, Joystick, XBox Controller, Gamepad, Microsoft Controller for Windows Additional Notes: Also supports Razer Hydra.